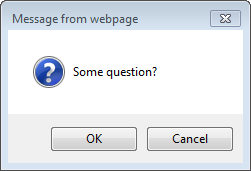 Browser modal dialogs can be troublesome for automation testers. Since it is a modal, the browser does not proceed with automation unless someone acts upon these dialogs. Sahi is built for parallel playback where browsers need not be in focus. Sahi has specific mechanisms to deal with modal dialogs. Sahi handles these dialogs by mocking them out. You will not see a dialog box when you playback via Sahi. However you will be able to control the user interaction with these dialogs with specific Sahi APIs. An alert box looks like this: There are 3 APIs used with alerts. $allalerts boolean optional If true, returns array of all alert messages. //return array of all alerts in the browser. info At times, a UI action causes multiple alerts to appear. To handle such a scenario, one can use _lastAlert(true) and check the last few alerts. info $allalerts added in 6.0.0. Scripts written before 6.0.0 do NOT need changes. $persist boolean optional if true, will accept a single _expectAlert statement for all alerts coming after the statement. If false, will accept only the next alert box to work with the _expectAlert statement. Default is false. _expectAlert tells Sahi to react with OK for a dialog with given message. //If Alert word expect in dialog then Sahi react with OK.
_expectAlert("/abc/",true); //Accept all alerts with "abc" message. 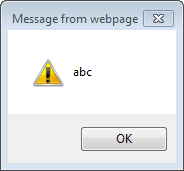 _expectAlert("/abc/"); //Accept only the next alert with "abc" message. _expectAlert("/abc/", false); // Tell Sahi to press OK for dialog with message containing "abc"
A confirm dialog looks like this: In a confirm dialog the user can either press OK or Cancel. Sahi by default clicks OK on the dialog. Sahi can also be told to press Cancel. $allconfirms boolean optional If true, returns array of all confirm dialog messages. //return array of all Confirms in the browser. info At times, a UI action causes multiple confirmation dialogs to appear. To handle such a scenario, one can use _lastConfirm(true) and check the last few confirmation messages. info $allconfirms added in 6.0.0. Scripts written before 6.0.0 do NOT need changes. $value boolean if true will press OK when a confirm dialog with given message appears. If false, will click on Cancel. $persist boolean optional if true, will accept a single _expectConfirm statement for all confirms coming after the statement. If false, will accept only the next confirm box to work with the _expectConfirm statement. Default is false. _expectConfirm tells Sahi to react with OK or Cancel for a dialog with given message. _expectConfirm("/question/", false); // Tell Sahi to press Cancel for dialog with message containing "question"
A prompt box looks like this: A prompt dialog is not very commonly used. Sahi by default behaves as if OK was pressed without entering any text. Sahi can be forced to enter text by setting an expectation via _expectPrompt API. The message on the prompt box can be obtained later by _lastPrompt() API. $allprompts boolean optional If true, returns array of all prompt messages. //return array of all Prompts in the browser. $response string Response to enter into the prompt. _expectPrompt tells Sahi to respond with given response for a prompt dialog with given promptMessage. info $persist added in 7.5.0. Scripts written before 7.5.0 do NOT need changes. // abc would be entered by Sahi in the prompt box. $persist boolean optional if true, will accept a single _expectPrint statement for all prints coming after the statement. If false, will accept only the next print box to work with the _expectPrint statement. Default is false. _expectPrint tells Sahi to react with CANCEL for a print dialog. Resets _printCalled to false, so that _printCalled can be checked once more in the script.